Anyone for some BLOG CANDY????!!!! Please note: There will be chances for extra goes at the Blog Candy & an awesome Raffle with prizes from FIVE, The Gadget Show, Ian Wright & Justin Lee Collins later on so make sure you pop back for that! Hi Helen. Some really fab blog candy. I have linked you to my last blog so hope you get lots of interest. Congrats on the shop opening. Links posted on my blog for both ME/CFS and your exiting new venture. I hope the coming weeks are not too stressful and hope next week goes to plan. Oh some fantastic candy! Congrats on your blogaversary, the new shop and the new challenge blog, which i can't wait to start! and link to your challenge blog added. This is very exciting! Good luck, I wish you lots of success with the shop and challenge. I've linked everything in my sidebar. Good luck Helen - I have created a little blog link for you from mine!! wow! what a fun & fabulous place. i just found you and i am now a follower! super images you've got too! thank you for the freebies. i offer freebie images on the 5th of every month over at my blog. please come by sometime. Managed to get my link back on - blog was playing up this am!! Hi, lovely candy and lovely blog, I am a follower, and have left my details in mr linky, and am a follower on the challenge blog too! I have linked you to my blog and thanks to chance to win! Congrats on you opening your new store! New follower and posted on my sidebar! Thanks for a chance to win! Good luck with the opening of your new shop and thanks for the chance of winning this lovely candy!! I'll be back to find out what's going on and the link is on my side bar. Thanks for nice candy. I linked it on sidebar. Hugs. Larisa. Good luck in everything, have link you on my sidebar. Fantastic candy! Congrats on your blogaversary, the new shop and the new challenge blog, which i can't wait to start! Hello Helen, I saw your candy at Susie Sugar and decided to have a look - the candy is fabulous (but I don't know how to spell the word correctly...) and I've put a post on my sidebar. great blog! thanks for the chance to win =) i'm a follower on both blogs. Congrats on your blogaversary and opening the new shop!! Thanks for the chance to win such yummy candy! I have it posted in my sidebar. Congrats on the shop opening and your blogaversary! thanks for the chance for some yummy goodies! I am a follower and have added it to my sidebar. what a great chance, thank you! Congratulations on your blog anniversary, the new shop and the new challenge blog! !I am a follower and face book fan. 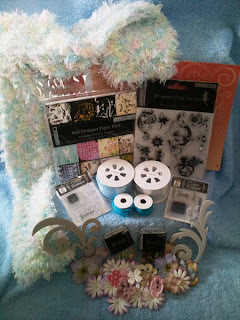 I have no blog but I am emailing my crafty friends and telling my scrapping group. Hi Helen:congrats for everything!!... and thanks for your candy. I've added your link to my blog. Hi Helen: congrats for everything... and thanks 4 your candy. I've just added your link to my blog. Congrats, congrats and congrats! You are very busy. Thanks for the chance to win. I am off to add you to my sidebar right now. Hello from Poland! Thanks for the chance to win. Lovely blog and good luck with the shop... thanks for the chance to win! What a wonderful candy, thanks so much for this generous opportunity! I habe linked you to my Blog and - of course - I am a follower of your beautiful and inspiring blog! Congratulations on ur shop & challenge blog. I love what you are giving away. Thank you for this wonderful chance to win. Wonderful blog candy! Unfortunately, I can't figure out how to use Mr. Linky.....don't know what to enter when they ask for a URL because I don't have a blog. Help!! I've been a follower for about a year and have just checked out your other blogs....can't believe you are able to keep up with all this! Thanks for the help Helen. I left my name with Mr. Linky!! you are doing a super job helen... well done!!! Congrats and thanks. you,ve reached along way. you have a very nice blog. Super! Thanks for the chance, to win this great candy. I have linked to my sidebar! Wow - that's some really great candy!!! fantastic candy! Congrats on your blogaversary!! Love your creations Helen! Thanks for the chance to win your lovely candy. Have done all that is required! Hi Helen. Love your blog. Thanks for the chance at candy and congrats on your New Look Shop. Blog candy???? Of course YES!!!! Dear Helen your blog candy is awesome!!! Thank you for the chance to win!!! Fab blog candy-you are very generous. I have linked you to my blog. I have Fibromyalgia and ME so amazed to find your blogs. Thank you for furthering this cause and raising it's profile. Wowie what a great candy,i am a follower. thnx for the chance to win this candy. I have the link on my sidebar. Thnx for trying twice,great blog you have here lots of beautiful creations. I've also shared this on my blog. What a great oppurtunity to win this goreous candy. What a great opportunity to win this gorgeous candy. How exciting Helen. I have linked to my blog and become a follower because I like what you create. Thanks for the opportunity. Wow, that is great blog candy, I advertised with a link to your giveaway, new challenge blog, and the CFS/ME awareness day on blog. Thanks for the chance to win can't wait to see what else is in store. I follow! I added to side bar! I LOVE elephants!!!! Wondered why everyone was saying hello to me, then realised you're a Helen too, lol. Have linked in a post and become a follower, fabby blog you have here!